Need your attic cleaned out? Call Robinson Services your local junk removal company. We specialize in Attic Cleaning in Malden, MA. If your attic is overstuffed with stuff you just don't want anymore then give us a call at (781) 322-1358. We can remove a few items or the entire contents of your attic. We will remove and dispose of your unwanted furniture, boxes or carpets. You name it and we will remove that unwanted junk or debris and sweep up the floor clean. Leave the dirty work and heavy lifting to us. Clean Outs and clean ups for residential homeowners, apartment buildings, condo developments, businesses, construction sites and more. Complete clean-outs of estate homes, evictions and foreclosures. 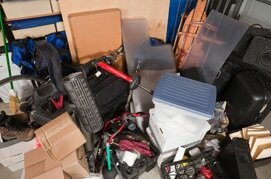 Removal of junk, trash or any debris left by previous owners or tenants. Call (781) 322-1358 for our attic cleaning services.